Homeport's Brenda Moncrief, left, Jennifer Heapy, CEO, Greater Dayton Premier Management, center, and Thomas Leach, Department of Housing and Urban Development Field Office Director for Ohio. Homeport's Brenda Moncrief traveled to the University of Dayton on Sept. 19 for a Housing and Urban Development seminar to explain how to effectively implement policies to eliminate smoking in houses and apartment living. Homeport was the recipient in 2016 of the highest honor (platinum) established by the Ohio Department of Health. Homeport has eliminated smoking in new and existing homes and connected its residents to programs to quit smoking. Homeport's initiative was a collaboration with Columbus Public Health. Approximately 200 individuals in real estate and property management as well as health departments and advocacy groups attended the HUD program at the University of Dayton River Campus. Radio One community affairs host Yaves Ellis, left, banters with Homeport's Layden Hale, right, and Isabel Giles. Homeport financial fitness and budgeting experts Isabel Giles and Layden Hale were heard on Radio One Columbus stations on Oct. 1 talking about student loans and their long term impact on individuals looking to buy a home. Isabel had written a column in September that explains how to smartly balance educational goals and paying for them. Isabel and Layden were interviewed by "Eye on the Community" host Yaves Ellis. Homeport Support Services Manager Lawrence Furst, left, and Homeport Resident Service Coordinators Maggie Wilson and Mark Childs. Homeport's new strategic plan calls for "Providing Security, Opportunity and Dignity through Affordable Housing and Laser Focused Support Services." The focus of that effort is 5,700 residents in Homeport's 32 resident communities. To excel at that commitment, three of Homeport Resident Service staff members -- Lawrence Furst II, Maggie Wilson and Mark Childs -- attended a national conference Sept. 24-27 of the American Association of Service Coordinators Conference held in Lake Buena Vista, FL. The Homeport employees were among more than 1200 individuals nationally who came to learn innovative approaches and models in serving residents of affordable housing. Homeport's Elim Manor senior apartment community on the East Side will play host to a hearing on the needs of affordable housing in Columbus. 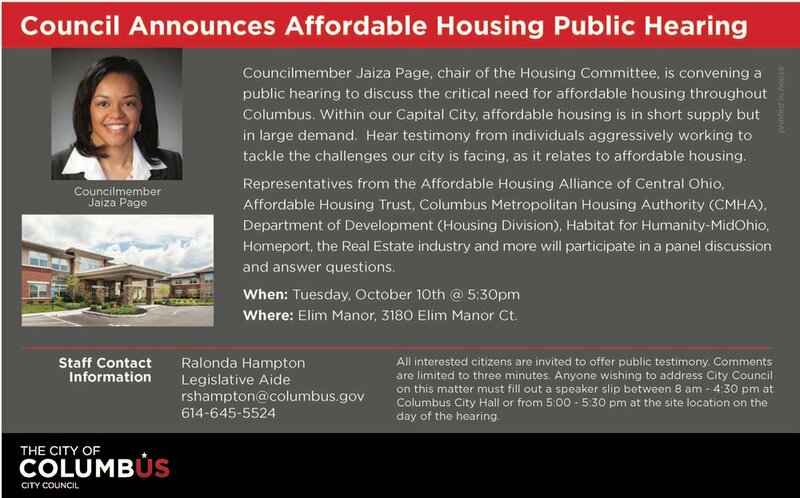 The Oct. 10 event is being held by Columbus City Council Member Jaiza Page. Page is chair of the city's Housing Committee. The hearing will include a panel discussion from several affordable housing organizations and advocates including Homeport. CTV, the city government television station, will be on hand to film. Homeport Senior Vice President Maude Hill will be featured in a first-time 2018 calendar focused on seniors in their 60s with inspiring stories of giving and healthy living. The calendar is called Columbus 60 Strong and was recently featured in a column by Joe Blundo in the Columbus Dispatch. Some of the individuals recognized have survived heart surgery, overcome cancer and won weight and fitness battles. Maude was honored for her perseverance on behalf of those in need despite suffering pain from a debilitating back injury. To read about the individuals featured in the calendar, and the calendar sponsor, click here.